I'm such a bad blogger! I didn't realize how bad this blog has been neglected. In part because I've been blogging a bit...just not here. If you haven't checked it out yet, come visit my new blog: Not Really a Hippie which focuses more on parenting and family stuff. 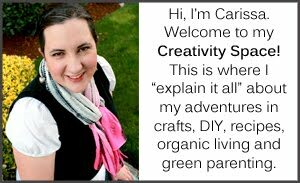 It's super new (I think I only have 3 posts) but will hopefully give me some space to write about mom stuff but leave this space free to talk about crafty things. This fall I've been tackling some sewing projects. My mom is an A-mazing seamstress and has made all kind of fancy and beautiful dresses and projects. I sew mostly straight lines. BUT I have recently tackled some more advance projects. Wait. Who am I kidding? They are actually pretty non-advanced. They just involve some non-straight lines so I like to pretend. Ha! I got an e-mail from a company I had previously bought a nursing cover from for a free baby sling on their new baby sling site. I've been wanting a baby sling so was more than thrilled to pay $12 shipping + handling to get a "free" sling. Bad news was that they didn't have any larger/taller sizes in and wouldn't until late November. Lame. So...I got adventurous. I found a great tutorial on My Karma Baby about how to make a sling that looked simple enough. And even if I failed, I only lost 2 yards of fabric, right? I bought 2 yards of brown linen at Jo-Anns for about $8 and began. The sling is a smidge big (I measured to the middle of my hip instead of the top of my hip) so we have to twist it to make it fit right when wearing him on our hip (Joe and I conveniently have the same shoulder-to-hip measurement). I've since made 2 more: Once for my cousin Connie and her daughter and another for me that fits better. I just realized I don't really have good pictures of those, so I'll need to take some to put up later. We're on a tight Halloween budge this year, so we are making costumes. We already had some yoda feet socks (they are actually dinosaur socks) and brown clothes. We just needed a robe and a yoda hat. The robe was pretty easy...fold a piece of cream flannel (1 yard on sale for $1.99) in half. Lay baby on the flannel, lining up shoulders with the fold. Trace around baby, leaving 2 inches or so of ease for the top and flaring out to a dress/robe shape at the bottom. Cut out around outline, adding additonal half-circle cut for neck and cutting a log slit of the front to make the robe. Hem sleeves and bottom. Sew 2 from cuff-to-bottom seams. Sew 1 inch strip folded in half all around robe opening to make a collar-type thing. Iron. Done. For the hat, I traced around the outline of a hat he already has that fits well onto a paper bag to make a pattern. I used a 1/2 yard piece of green fleece to cut out the hat and make some big yoda ears to attach to the sides. Added some forehead wrinkles. Wha-la! Yoda costume for about $5. The third thing I did was make matching baby pumpkin hats for the babies coming to our family's annual fall party. I just realized I am short on pictures (and this post is getting pretty long as it is) so this will be a topic of a future post. If I get organized I might even be able to make a tutorial! Better pics (and tutorial?) to come soon!